The Speech I Would Like to Hear as Binyamin Netanyahu Addresses the United Nations General Assembly. Leaders of the nations of the world, I address you today in New York just days after the Jewish people commemorated 5774 years since God’s creation of this world. The nation of Israel has a long and rich history. Abraham, Issac, and Jacob, our fathers, walked the land of Israel and heard the divine promise that this land would be the inheritance of their sons forever. Our mighty kings David and Solomon ruled over the land with the wisdom of the Torah as their guide. Our great Temple stood as the central focus of Jerusalem and was the place where the entire nation of Israel would gather three times each year for the festivals of Pesach, Shavuot and Sukkot. Nearly 2000 years ago, our country was overrun by Roman imperialism when the conquering Romans, out of hate and envy, destroyed our Temple and holy capital city of Jerusalem and banished our fathers from the land. The Jewish people spread to the four corners of the globe, where they have been hosted by almost each and every one of the lands represented here. Often, that hospitality was not kind, and at times it became outright oppressive. Living or dying with inquisitions and pogroms became part of the stateless reality for the Jewish people. But we never gave up hope for a return to our homeland. From those same four corners of the earth, Jews have faced Jerusalem three times daily to pray that HaShem, the God of Israel, would have mercy on His nation and gather us back to our homeland. Over the past hundred years, the world has witnessed a unique and amazing phenomenon – the gathering of a nation and its re-establishment as a country and culture in its historic homeland. Against all odds, the nation of Israel was reborn. Our prayers have been answered; a Jewish flag flies over a Jewish parliament in the Jewish capital, protected by a Jewish army. I am aware that there are some people who are not happy about Israel existing as a Jewish state in the historic homeland of the Jews. To those, all I can say is “too bad, I realize that you can’t make everyone happy.” Our response to that will be to continue to do the best we can in all fields. There is much benefit that the international community could derive by learning from Israel. Due to our poor relationships with our neighbor states, we have had no choice but to be outstanding in developing defense systems, but we also excel in high tech and medicine. Although we are a tiny country, we make an effort to provide medical assistance to other peoples in need and are quick to offer emergency relief at times of crisis. In spite of the above-mentioned strained relations with our neighbors, many, many Arabs have still received first rate medical care in Israeli hospitals. These include hundreds of Syrian civilians hurt in the ongoing civil war there, as well as many thousands of Palestinians from Gaza, Judea and Samaria. By the way, I must express my great gratitude to HaShem, the God of Israel, who has given us the ability to again be an independent nation standing on our own ground. In 1967, the heartland, Judea and Samaria – with Jerusalem in its center – again came under Israeli rule. So it shall be: Israel will never leave those lands again. Judea and Samaria will always be a part of the State of Israel on the same standing with the Galil and Negev. Jerusalem is our capital – the center of our nation. We extend a hand in peace to our neighbors. Normal relations would benefit all sides. We would be glad to use our technology for the benefit of the entire region. Israel is a world leader in recycling water. In agriculture, we are currently using 70% water that has been purified and re-used for irrigation. In a dry desert region with water resources becoming scarce, it is a shame not to be able to share the wisdom that we have gained from experience. But on the other hand, I must point out to those who breathe hate and speak of annihilating the Jewish state and hurting our people wherever they might be, that Israel has a very long arm and a finger that is always on the trigger. The Torah teaches us that if one rises to kill you, you should kill him first. If pressed against the wall, you know that we will always shoot first and ask questions later. To this gathering, the UNGA, I must be frank: you have failed too many times in your mission to protect those in need. Your impotence in the Syrian situation is embarrassing. Still, as in years past, you tend to focus too much of your effort on criticizing Israel. I am sorry to have to say this to your faces, but there is an abundance of hypocrisy in this organization. Human rights in many of your countries are lacking. Clean up your own ship before you send mock flotillas to the people of Gaza. With all your talk of Israeli oppression of Palestinians, you fail to explain how the Palestinians under Israeli control have a longer life expectancy than citizens of many Arab countries. For 70 years, you have cultivated the myth of millions of Palestinian refugees, while you ignore one million Jews who were expelled from Arab lands in the first decade of Israel’s existence. Israel absorbed the Jewish refugees with no help from the Arab world, who ran them out and exploited the properties and wealth they left behind. The Arab world must recognize and allow those who have lived in their countries – and surely those who were born in them – to integrate and become citizens of those countries. As I now return to my home, I call on all international leaders to come meet me in Israel and to establish proper diplomatic relations – starting with maintaining your country’s embassy in our capital – Jerusalem. Four years ago, I wrote a column criticizing an American presidential candidate for coming to Israel as part of his election campaign. I felt that he was manipulating our country as a backdrop for a photo op. He wished to transmit a message from here to his Jewish voters – and more importantly, his Jewish donors – that they could clear their consciences. They could support him and still be able to call their Jewish mothers and tell them that Obama is a friend of Israel. As “proof” of that, he took time from his busy election campaign schedule to visit the Jewish state and tuck a note in the Westen Wall. Back then, I had a feeling that a man who had been affiliated with racist haters of Israel – the Nation of Islam’s Louis Farrakhan and Chicago preacher Jeremiah Wright – would not grow into a true lover of Israel, and I was right. I was wrong, however, in thinking that this publicity stunt wouldn’t help him, and that the American people would see through it and could be trusted not to elect a man so bad for their own interests and so bad for the long special relationship between America and Israel. I did not realize then how Obama would use this blessing from the land of Israel and succeed in raking in major Jewish support in America. Nearly 70% of America’s Jews voted for Obama in the last elections. Apparently, they are not reading my column – or at least weren’t reading it back then. But let’s be clear, American support for Israel is not a side issue or a favor to Israel and the Jews. This is not an issue of dual loyalty. As many American Christians and others have come to realize, the practice of blessing Israel blesses them in return. A strong Israel is a benefit to America, because it is a reliable ally, like no other in this difficult region, maybe like no other anywhere. For those who believe in the Bible, the explanation is easy to come by. In Genesis 12:3, G-d promises a blessing to those who bless Israel. For those who don’t read the Bible, our track record will have to do. America has never gone wrong for standing with Israel, and has not done so well when it hasn’t. Today, I remember the piece I wrote on Obama’s campaign visit to Israel, as another American presidential hopeful makes his show of support for the Jewish people. I am hopeful that Romney wins the elections in the US in November. I really don’t know what expect from him, but hope that Obama will be leaving office ASAP. Romney’s repeating of the expected mantra about America standing with Israel if Israel attacks Iran is not very convincing, and is pretty close to meaningless. Iran is not the private problem of the State of Israel – it is a concern for the entire free world. A true friend of Israel will give full backing to rewriting of the format and expectations for peace in the Middle East, recognizing the total failure of the Oslo and Road Map concepts, and acknowledging that we live in new circumstances after the fall of Gaddafi, Mubarak and soon-to-fall Assad (and King Abdullah). Continued efforts to bring life to the PLO by pretending that it is friendly, not corrupt, and that working with them is a realistic avenue for peace is the opposite of friendship to Israel (or the Palestinians, for that matter). Regrettably, I feel unhappy today with Mitt Romney’s visit to Israel: not because of the intention, which I believe is good, but because of the choice of the visit’s date – which is terrible. On this day, the 9th of the Hebrew month of Av, the Jewish people mark the anniversary of the destruction of our holy Temple in Jerusalem – the greatest symbol of Jewish national sovereignty in the land in the long history of Israel. This is the saddest day in our yearly cycle. We fast from before sundown the day before, until after sundown of the day itself. We go shoeless and do not bathe; we don’t even wash our hands or brush our teeth for some 25 hours. On this day, we sit on the floors of our synagogues and read the book of Lamentations. This is not a day for us to host honored guests. In accordance with our tradition, we don’t even greet one another. How could our national leaders show such an important guest around without disregarding the laws and customs of our most intimate day of public mourning? But on the other hand, they do not want to be disrespectful to such a guest and turn him away. I am very disappointed in those responsible for the timing of this visit. I do not expect Romney himself to learn all the manners and customs of the Jewish people, but I do expect one who sets out to repair relations with Israel to be a little more considerate. Think of this distinguished visitor coming to the Kotel for a photo op, all shining clean and smiling – while walking by Jews sitting on the ground in mourning for our Temple that once towered over that very spot. It is about as close as an insult to our dignity as could be conceived. It is something like coming to someone’s mother’s funeral and asking for cake, and then posting your picture all over the internet eating the cake, and commenting how much you love your host and promising to put in a good word for him if he has a problem with his neighbors. After eight days of what Israel called the “Pillar of Cloud Operation”, can any side involved claim even a small victory? It’s hard to offer a positive answer to that, although many are proclaiming themselves to be the heroes of the day. Israel claims that their operation “severely impaired Hamas’s launching capabilities.” According to Hamas, their rocket strikes led to the ceasefire deal. The USA, the UN and Egypt each claim that their own interventions led to the ceasefire agreement. If all of this is true, then this operation was a Win – Win (and Win – Win – Win). Everyone involved can turn to their constituents with pride and pat themselves on the back, saying “We are great.” But is that the case? I think not. It seems that all involved have major doubts about what really went on behind the scenes, and wonder how this ceasefire will benefit their people in the long run. Those who feel they gained from this operation are mainly public figures who received a lot of free airtime on TV. For Israeli officials, that airtime is crucial now – only weeks ahead of the elections here. With more than half of Israel’s population under rocket fire, anyone who can get on TV and promise to do whatever he can to stop the rockets knows that he is speaking to many potential voters about the most acute problem they are facing. On the flip side, Khaled Mashaal and the Hamas leaders were given a major platform to present themselves as the protectors of the people of Gaza while under attack by Israel’s Air Force planes and warships. But this also upgraded Hamas to being the relevant representatives of the Palestinians on the international negotiation table. Egyptian President Mohamed Morsi (and his Muslim Brotherhood party) achieved much-sought international recognition as a key regional player and mediator between Israel and the Arab world. US Secretary of State Hillary Clinton, the UN General Secretary and the Arab League Chief all made their own runs for the TV cameras, to appear as if they are somehow effective here, while in fact, they have all proven to be totally impotent in offering any relief to the people of Syria, who are facing genocide by their own government. While all parties are up in arms about the current exchange of rocket fire between Israel and the Islamists in Gaza, all efforts are focused at halting the rockets now. Not enough consideration is given to long-range solutions to this very serious problem. According to the CIA World Fact Book, the population of Gaza is 1.7 million people in an area of 360 square kilometers, with no access to any natural resources. Half of the population is under age 17, and they have a 40% unemployment rate. Those who do find work can expect low wages as a norm. They are ruled by the Islamic fundamentalist Hamas movement, which terrorizes its own population, and due to its rocket attacks on Israel, has forced Israel to monitor and limit its imports. Gaza’s citizens have not been able to work in Israel since the 2005 disengagement, which saw the forced removal of all Israeli citizens from that area and closed its border crossings. The disengagement saw 7,000 Jewish residents of Gaza displaced, while their homes and businesses were destroyed. Many of those Jewish-owned businesses and farms also provided workplaces for Palestinians. Those workplaces no longer exist. Pushing Israel out of Gaza did not improve the situation of the local Palestinians, but on the contrary, has worsened their ability to provide for their families. Their security and Israel’s have both deteriorated. Worst of all, all involved in forcing these “arrangements” seem to ignore the fact that there is no hope on the horizon. Are 1.7 million Palestinians in Gaza meant to live off of international aid forever? Or are they to be forever hungry and enslaved to radical Hamas? What image do people see in their mind’s eye, when they hear “Judea and Samaria”? Do we realize that this image is on the front lines of the information battle for Israel today? There are scores of NGOs, media outlets, student groups and others that are dedicated to presenting a negative image of Israel. Most of their arrows are aimed at the heart of the area that they call “the West Bank.” I am setting out to write a series of articles on the importance of branding the image of Judea and Samaria positively as part of an overall effort to secure the future of these regions as part of Israel forever. A few years ago, shortly after I established the Shomron Liaison Office, I became aware of a special department in Israel’s Foreign Ministry that actually researches country branding. The department was then headed by Ido Aharoni, who is currently Acting Consul General at the Israeli Consulate in New York. Now, I do not see eye to eye with all of Ido’s conclusions, but I do agree that the results of his intensive research are very valuable and should be studied and used for future strategizing. If that is the case, and we have been using the correct method of representing Israel, then it is time to ask ourselves, “What went wrong, and who did this to us?” For a hundred years, we have been using this strategy – and the world still supports the other side. Why is that? I won’t answer all of these questions in one shot, but will leave some room to consider. For now, though, let’s ask ourselves what image we would like people to call to mind, when they hear “Judea and Samaria.” Do we want people to think of this as a dangerous war zone that normal people should avoid? Or do we want them to share our vision of this place as the heart of the Jewish national homeland – a place that should be invested in, built up and protected for the future of our nation? Some think that if we highlight every act of violence by Arabs targeting Jews, we will harvest sympathy for our interests, while proving that there is no partner for peace and that we are the good guys, etc. On the other hand, by highlighting every act of violence in this region, we are also securing the branding of this area as a war zone, which carries with it a heavy price. Many people will conclude that if this area is so dangerous to live in, then there is no sense in living here, and something should be worked out to help Jewish people move away; at the very least, they should surely not be encouraged to stay. So I do not think that this overused violent image can serve the goals we have in mind. What we should be projecting to the world is that the Jewish communities in Judea and Samaria are a solid fixture in this region. 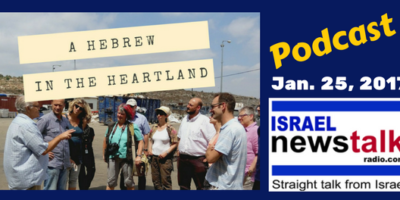 Hundreds of thousands of Israelis have chosen to make their homes and raise their families here because they believe that this is the heartland of Israel. These communities are growing five times more quickly than the national average because Israelis see their future and the future of their children here. The truth is that people in Judea and Samaria live a very normal, happy and calm lifestyle. They enjoy a comfortable standard of living and provide a high level of education for their children. As we say in Hebrew: kan garim b’kef – it’s fun for us to live here. It is crucially important that people who are interested in Israel and Middle East issues become aware of the reality that the so called “settlers” are not participating in some kind of ongoing demonstration or serving as bargaining chips for future negotiations. The Jewish communities of Judea and Samaria are not part of a problem that needs to be resolved; they are an expression of Zionism that is alive and kicking. From my experience, the pioneering spirit is something that resonates with many – it is looked on enviously, by people who want to participate and believe they can make a difference. I suggest that we distance ourselves from the negativity and proactively take our narrative to the positive side. I believe that this will earn our agenda respect – not only from those who were previously convinced – but even from those who are opposed to our goals. Two timely columns in different publications have me thinking about humanity’s most basic obligation to ourselves – integrity. Are you honest enough to ask yourself if you are truly confident in the statements you are making – or are we all just going through the motions of a pre-set script and playing the parts that are expected of us? My close friend and colleague Avi Zimmerman, who heads up international relations on behalf of the city of Ariel, published a column in the Times of Israel on the theme of Purim. On this holiday, it is customary to wear a costume and to drink alcohol. Both traditions, the writer explains, raise questions and expose who is really hiding inside the individual’s body. The sages of the Talmud are quoted as saying that when wine goes in, secrets come out. Hiding behind a mask can be a reminder that while this might be fake, there is a real you. Wow. Asking those things does take a lot of intellectual courage. I am sure that many members of the choir were not overly pleased to hear this preacher’s message. It is so much more fun when we can all gather around and pound on our chests and expect only words of encouragement and pats on the back. Apparently, she came under a hail of criticism for daring to report on Israel’s democratic process, in which, contrary to the norm in the rest of the region, citizens actually elect their leadership. While criticizing Arabs for not knowing enough about the Israeli “enemy” might not sound so positive, the mere fact that the writer needed to publish a type of retraction shows that many Arabs fear that opening this topic for discussion breaks an opening in the wall of non-normalization with Israel. Could her critics be saying, “we would rather be ignorant of Israel than take a chance of knowing the truth” – and possibly finding out that we have common interests? It seems that both writers – from opposite sides of the fence – are offering similar challenges to their own “choirs” by suggesting that they ask themselves to examine their positions and be sure that they understand why it is that they believe as they do. The authors give excellent encouragement to a practice of self-examination we should all engage in regularly, in order to promote more authentic discussion between sides. Jeffrey Goldberg wrote a piece from his recent exclusive interview with Jordan’s monarch, originally titled “Monarch in the Middle,” which seems to be a spin on “Monkey in the Middle,” or maybe a Freudian slip. However, only an hour after that first release, the article appears under a more serious title. Goldberg paints Abdullah II as a dynamic, young and intelligent leader working to bring Jordan into the 21st century. Jordan has no natural resources and its economy relies on foreign aid from the west and the Gulf states – and taxes. Still, the unelected ruler of this poor state and his family manage to live like royalty. Abdullah is praised in the west for being “modern” (mostly due to the fact that he was educated in the west). His neighbor to the north, Bashar al-Assad, also lived and studied in the west until he too was called to the throne. Both of these western-educated men now head undemocratic totalitarian regimes that greatly limit the freedoms of their peoples. Goldberg goes on to tell of his day hovering up above it all with the hero king. Together, they land in Karak to have lunch with the leaders of one of Jordan’s larger Bedouin tribes. For those who are not familiar, he explains that the Jordanian monarch’s power base comes from the elite Bedouin community, which makes up a minority of the kingdom. Although up to 60% or 70% of the population are only 2nd and 3rd generation Jordanians of Palestinian descent, they are stripped of rights and pay higher taxes to support the monarchy (for more on that, Google Jordanian writer Mudar Zahran). The interaction that Goldberg saw but didn’t understand is basically a simple Bedouin negotiation. Abdullah needs the support of the tribal leaders to retain his position of power and his lavish lifestyle, and they, in return, are asking for part of the action. They are actually asking for very little in return – a few jobs for some young men in a poor country that still humors a royal family and its toys. What Goldberg overlooks is the fact that Abdullah himself is really just another Bedouin getting paid by America to hold a stick. His toy Mercedes, Black Hawk and lavish palaces are subsidized by American taxpayers’ money and supplemented by the taxes of his Palestinian subjects. Goldberg does mention in passing that the Hashemite dynasty were originally immigrants to Jordan themselves (Abdullah is a 2nd generation Jordanian, just like many of the Palestinians he rules over). The sons of a Bedouin tribe leader from Mecca (in Arabia – some 1200km away) were awarded part of the territory taken from the failing Ottoman Empire. This was their prize for assisting the British in their plot against the last Muslim caliphate and also a way out of their local conflicts with other tribes in Mecca. To gain some perspective, remember that the country of Jordan did not exist 100 years ago. The Hashemite Kingdom of Trans-Jordan first came into the pages of history in 1922, after the British Empire invaded the holy land. In order to form the state of Trans-Jordan, the British carved away 70% of the Palestine Mandate that had been marked out for the establishment of the Jewish national homeland by the British Balfour Declaration of 1917. This then – the original “Two State Solution” – left only the area west of the Jordan River for the future Jewish state. That’s the history. Who knows what the future holds. Goldberg does not hint that the king is losing his support, even among the Bedouin community. The alternative is to open the country up for democratic elections, in which all citizens would vote for their leadership. While there is doubt whether the Bedouins would all line up in support of Abdullah, there is no doubt that, given the opportunity, the Palestinians will vote him into unemployment. In light of the Arab Spring phenomenon sweeping through the Middle Eastern countries currently, the future of the Hashemite monarchy becomes even less clear. How much longer will the people of Jordan agree to being stripped of their rights while Abdullah lives it up at their expense? Many believe that Abdullah is next in the line of dominoes whose turn will come after Assad’s fall. Abdullah woos the west with words of concern over the Muslim Brotherhood, who – he warns – could pose an alternative to his leadership. To western ears, he calls the Muslim Brotherhood a “Masonic cult,” while he doesn’t bother to mention that in all the Arab countries Hashemites like himself have been exceedingly cooperative with their local branches of the Muslim Brotherhood and the Brotherhood’s leaders have enjoyed their support. It is not clear how much longer Abdullah will be able to play with the nice toys the west provides him with, but it seems that if he doesn’t start giving a share of the stick to some of the other Bedouin guys, he might lose the hold he has on his own.